Today was the final day of the Gracefool Collective's pilot season of ProDance Leeds, providing thrice-weekly professional dance classes, so it seems to be an auspicious day for them to be the subject of the first of a series of features on regional artist-led initiatives to support dance artists within their local communities. The dance industry of Leeds has gone through several transitions over the last few years; in March 2014, the 'City of Dance' campaign was launched, aiming to showcase Leeds as 'the dance capital of the North', and a few months ago, Yorkshire Dance and Northern Ballet advertised for a consultancy role to help promote Leeds as a hub for dance. Yet even two years ago, this would have been unthinkable. Despite being the home of the Northern School of Contemporary Dance (NSCD), one of the UK's top three dance conservatoires, there was so little support for independent dance artists in Leeds that graduates were expected to either return home after graduation or move to London to seek work; if they stayed in Leeds, they would be at a disadvantage, due to the shortage of professional classes; one dancer told me several years ago about how much she struggled in national auditions, only being able to take class once a week compared with other dancers with access to daily class. This was also possibly why more conceptual work was promoted in Leeds, as it was less dependent on maintaining one's technique. Without having key resources such as frequent professional dance classes on offer, Leeds did not appear to be a freelancer-friendly city to upcoming graduates: although the city could boast established companies such as Northern Ballet, Phoenix Dance Theatre and Balbir Singh Dance Company, they were perceived as very separate and disconnected from the world the new graduates were entering. And without frequent classes - the only classes on offer were weekly classes at Yorkshire Dance, or company class at Phoenix Dance Theatre or Northern Ballet, if you could sneak in - being a freelance dance artist in Leeds was easily a very lonely and isolated activity, without the sense of community you associate with regular class. And then the Gracefool Collective happened. And things have changed significantly in Leeds because of them. Meet Kate Cox, Sarah Cook, Sofia Edstrand, Rachel Fullegar and Rebecca Holmberg, the original Gracefool Collective members: five women who moved to Leeds to train at NSCD and, when everyone else was expecting to leave Leeds after graduation, they found they were receiving enough support and interest in their work for them to stay on in Leeds and continue developing their practice there. Although they found it scary to be the only ones choosing to stay on in Leeds after graduation, the impact of that decision has been huge: by signalling that Leeds is a city where dance artists can continue to work, they have inspired many recent graduates to stay on as well, completely transforming the dance ecology of Leeds. The idea for ProDance actually started two years ago; Rebecca Holmberg was injured shortly before graduation and was anxious to get back into dancing once she'd recovered... yet there was nowhere in Leeds to go. Gracefool continued to develop and present work, but eventually realised they had reached the limit of what they could create without maintaining their technical training. A chance encounter at The Place in London led to Kate Cox meeting Azzurra Ardovini, formerly of Phoenix Dance Theatre, who felt strongly about the need for regular professional class in Leeds, and as it turned out, Azzurra was merely the first in many people who helped, supported and advised Gracefool over the months it took for ProDance to become a reality. 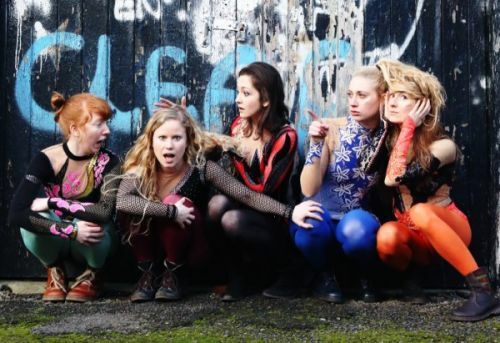 The Gracefool Collective were then selected as the Catapult artists for 2014/2015, receiving a one-year programme of support from Yorkshire Dance, NSCD and Spin Arts. On 27 November 2014, they were able to announce that their Arts Council application for funding had been successful, and the first class took place two months later, on 26 January, taught by Anthony Middleton, who had recently relocated back to Leeds. To be clear, the Gracefool Collective are not the first people to have tried to initiate regular professional class in Leeds. When they were planning their pilot season, which ended today, they encountered organisations who advised them against proceeding, because they had tried it previously and failed. Other artists felt that there was not enough of a demand for such a project to be viable. But what makes ProDance a success is that it is an artist-led initiative: it is a project devised by artists to meet their fellow artists' needs. And this is what has made the difference: even in its initial months, ProDance has managed to integrate fully into the professional dance community, to the extent that any artists carrying out research and development projects automatically send their dancers to ProDance's classes; dancers who are in Leeds for other work or for other projects will also attend ProDance classes, because they're taking place. ProDance has had dancers travel from Manchester, Harrogate, Sheffield and South Yorkshire for class, although less frequently - such is the need for this provision. But what I think has been most crucial to ProDance's success - besides meeting a long-neglected need, that is - is how they have managed to attract much of the dance world's teaching royalty: for example, Kerry Nicholls, Eleesha Drennan, Jorge Crecis, Stuart Waters, Yael Flexer, Deborah Light, Gary Clarke and Natalia Iwaniec. Gracefool attribute this success to Azzurra's belief in their work, personally phoning around her teacher friends and vouching for the value of ProDance, persuading them to participate when they might not have otherwise signed up. And since ProDance was launched, they have been approached by many teachers wanting to be involved. And it's not just been about importing snazzy teachers from London, when they have had plenty of snazzy Northern teachers waiting in the wings: the first and last teachers of the pilot project were Anthony Middleton and Matt Lackford, both returnees to Yorkshire, while other Northern teachers have included Phil Sanger, Jack Webb, Azzurra Ardovini, Joss Arnott and Jamaal Burkmar. Although Gracefool have yet to complete their evaluation, the results are obvious. 130 different people have attended class over the last six months, and not all of them have been from Leeds or Yorkshire. Their average attendance rate is nearly double their original target figure, with as many as 23 people per class, drawing teachers and students during half-term, showing how essential these classes are. And they are philosophical about people not attending their classes: they see that the project is a success if dancers cannot turn up because they're working. And in fact, one of the plans Gracefool has for ProDance's future is to increase the classes to daily, because all freelancers work erratic schedules, and the more classes that are on offer, the greater the chance that you can catch someone on their one free morning. And in six short months, the impact of ProDance on the Leeds dance ecology has been enormous. By choosing to stay on in Leeds, the Gracefool Collective had already started to inspire other dance graduates to stay on, but now they have a significant incentive to do so: as far as new graduates are concerned, they know Leeds and there's regular class, so there's no need to move on. And with the perfect triangle of the obscene cost of living in London, the very reasonable cost of living in Leeds, and the offer of regular classes, an increasing number of dance artists at all levels are choosing Leeds for their interim base between projects, which is swelling the ranks of the dance community. And community is the key word. Whereas the members of Gracefool Collective originally felt isolated after graduation, the regularity of classes have really developed the sense of community among Leeds's professional dance artists, providing networking, and the sharing of professional development and work opportunities, as well as a stronger sense of cohesion. Besides simply dancing again, this has been one of the things the Gracefool members have enjoyed the most: developing the sense of community, feeling connected to the dance world, making links with teachers and venues, and ultimately, doing something good: helping people find opportunities. It's also important to acknowledge that this is simply a small part of the whole process: Gracefool Collective and ProDance would not have happened without the huge number of people believing in them, supporting them, being willing to advise them on anything, and willing them to succeed. And the ripple effects of Gracefool and ProDance can be felt across the city. No longer are dance artists discouraged by the lack of provision by the local dance agency; instead, dance artists are learning to be proactive, to explore interdisciplinary work, bridging disciplines and dictating what they want to create and where they want to show it, especially in non-traditional venues. Again and again throughout our conversation, the Gracefool members talked passionately about how innovative the Leeds dance artists have become, how diversifying the work that they do has enabled them to be freer about what to create and where to show it, and most importantly, who to collaborate with. So what lies ahead for ProDance? In the immediate future, their evaluation and their next funding application, once they've collated all the stats, feedback and survey results from the pilot season. After that, they are focussing on how to develop ProDance as a business model and on what funding and structures are needed to make it sustainable. While ProDance's success is in it being an artist-led project, and it has taught each of the five members a huge amount of business skills over the past year, the success of the pilot project has reinforced how essential it is to the dance ecology of Leeds to have regular classes in place, and it should not be dependent on five dance artists putting their creativity on hold and relying on Grants for the Arts funding to keep these classes happening. And yet, with such significant changes happening within only six months of these classes, you have to ask what is next for Leeds? Gracefool feel that there now has to be a better structure in place for organisations to support artists in making new work; people still have to go away to other parts of the country to create work, and surely, this is the next step which needs to be addressed. But for now, we want to congratulate and thank Kate Cox, Sarah Cook, Sofia Edstrand, Rebecca Holmberg and Rachel Fullegar for all their incredible work in making ProDance a reality (and such a successful one), and we wait to see what the future holds for them.